Jim Endress, Highland Community College trustee, was recently honored for serving a one-year term as president of the Illinois Community College Trustees Association (ICCTA) during the 2017-2018 year. 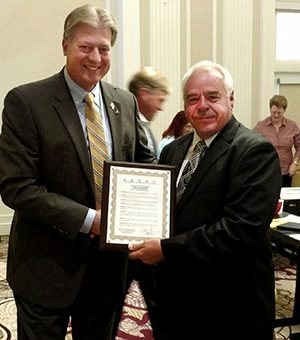 At the September 15 meeting of ICCTA, held at the Pere Marquette Hotel in Peoria, IL, Endress was honored with a resolution recognizing his leadership as president, which included lobbying the Illinois General Assembly for sufficient operating funds for the state’s community colleges. “President Endress stands as a model of public service who brought honor to his home institution, Highland Community College, through his leadership of ICCTA,” said Fritz Larsen, current president of ICCTA. Endress has served on the Highland Board of Trustees since 2007. He lives in Shannon, Ill. with his wife, Deborah. Photo caption: ICCTA President Fritz Larsen, left, presents Jim Endress with a resolution honoring him for his years of service to the Illinois Community College Trustees Association.